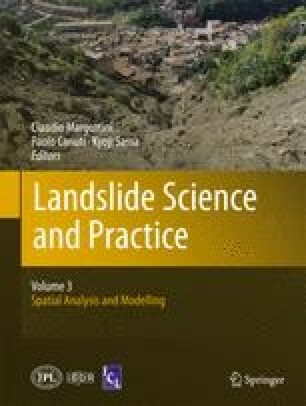 The aim of this study is the development of an integrated approach for definition of scenarios of debris flow deposition. The approach has been applied to basins located in the North-western Alps. Firstly the basins are classified on the basis of the bedrock lithology. Hence the features of debris flows are related to different bedrock lithologies: basin area/fan area ratios, alluvial fan architectures, depositional styles and triggering rainfall characteristics. This method permits to capture the essential features of flow phenomena and to address the choice of proper constitutive laws for the numerical modelling of debris flow propagation and deposition. The numerical model calibration is based on the observed styles of deposition of debris flows and architecture of the alluvial fans (shape, slope, grain-size distribution, etc.). The simulations do not match the deposit of a given past event, but the results are in terms of scenarios and supply a more realistic tool for risk mitigation. This research was supported by PARAmount project of Alpine Space Programme of European Union (2-2-2-AT) – http://www.paramount-project.eu/.